Only three months into her newly appointed role as 9 Story Media’s Chief Creative Officer, Angela Santometo is planning her trip to MIPCOM, the largest global market for entertainment content, where she will participate as a speaker in The Creator’s Superpanel (Saturday, October 13th), amongst other leaders in children’s television. Angela is an original Co-Creator, Executive Producer and Head Writer for the breakthrough and award-winning Blue’s Clues. She is also the Creator, Executive Producer and Head Writer for the smash hit Daniel Tiger’s Neighborhood (PBS), as well as Super Why! (PBS), Creative Galaxy (Amazon Studios), and Wishenpoof! (Amazon Studios). When she’s not representing 9 Story Media Group at industry events, Angela plays a major role in driving the company’s creative vision and heading 9 Story US. We talked to her about her journey into animation, what her day to day looks like and what she hopes to achieve in her role as CCO. 1. What is your role at 9 Story US and what does it encompass? I’m in the newly created role of CCO -Chief Creative Officer. I work directly with Vince Commisso (Founding Partner), Natalie Osborne (CSO) , Cathal Gaffney (COO) and Blake Tohana (CFO) to create, strategize, and inform our company’s creative vision. I oversee the creative strategy and provide creative input for the whole 9 Story brand, on both the existing properties and those in development. 2. What is your origins story? Aka, how did you get to where you are today in your career? I have a master’s in child development psychology and instructional technology and media. I started in Nickelodeon’s research department and then transitioned into Nick Jr. preschool programming. I created Blue’s Clues, with Traci Paige Johnson, in 1995. 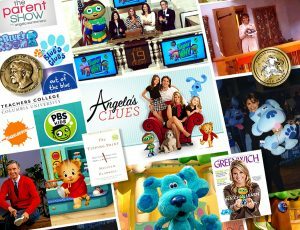 After 10 years of Blue’s Clues production, I started Out of the Blue where I created Super Why (PBS), Daniel Tiger’s Neighborhood (PBS), Creative Galaxy (Amazon), Wishenpoof (Amazon) and the new Charlie in Colorform’s City (premiering on Netflix). Also, Blue’s Clues is being refreshed for next year! 4. What can we find you doing on a daily basis? I do a lot of writing, strategy planning, creating and editing. And lots and lots of meetings! I work with each of my creative teams in New York as well as the development teams in Toronto and Dublin. 5. Who is one of your biggest influencers? Gerry Laybourne is a mentor and influencer due to her innovative, creative leadership. Her vision for Nickelodeon changed the way I look at the business of children’s media. Fred Rogers is also my biggest influencer because of his vision for how to use media to spark children and speak to them with respect. I was that kid who couldn’t sit any closer to the TV when Mr. Rogers’ Neighborhood was on. I really felt like he was talking directly to me. It’s what inspired me for Blue’s Clues when Steve would talk directly to the camera, right at the viewer. 6. What parts of your role do you find most challenging? And what have you found is the most challenging aspect of working in animation? Finding enough time in the day is the most challenging! I’m excited and passionate about finding and cultivating the best talent, the best shows, and the best new way to creatively produce them so that they are signature, distinct and fresh. The most challenging aspect, for me, in animation, is not living with the studio. For Blue’s Clues, we had 40 animators working with us full time in the studio and we became a family. The passion animators have to create and the talent and time it takes are never lost on me. 7. Where do you draw inspiration from? And how do you make sure to stay creatively relevant in a competitive and dynamic industry? I constantly draw inspiration from kids, themselves. I observe, listen, want to play and watch what they are watching and how they are watching. I also challenge our dynamic industry as a leader – not a follower – where we innovate, create groundbreaking series, and be the best. 8. As the newly appointed Chief Creative Officer at 9 Story USA, what do you want your mark to be? I want to ensure that we have the most highly sparked, passionate and talented people who want to change the world with our creative work. Our shows, our series, our art will stand the test of time and empower, challenge, and influence kids all over the world – – while making them laugh. 9. What advice would you give someone who is pursuing a career focused on kids and family content? Let them show you what they love, what excites them, and what they’re passionate about. Ask lots of questions, then listen, observe and learn. 10. Last but not least, what are your “words to live by”? Be kind, be persistent, be badass and make stuff. When no one understands what you are creating, it usually means you are onto something big. Respect your audience, know your audience, bring it for your audience. I enjoy spending time with my kids and husband, watch a lot of tv, drink wine and love to travel. Since I’ve created Daniel Tiger in my mind, I think I look a lot like him. For more on Angela and for her latest news visit angelasclues.com or follow her on Twitter and Facebook.